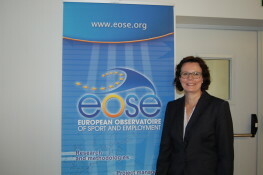 The leadership of the organisation is ensured by EOSE’s Executive Board. Taking the main decision for the organisation. Providing a vision to the organisation and ensuring that its mission is fulfilled. 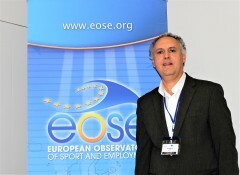 Representing EOSE within EU events. Ensuring a strong and efficient relationship with the decision makers such as the European Commission or the Sport Directors. Creating an efficient atmosphere and synergies within the organisation. Here below you can find out about EOSE’s Executive Board Members. Prof. Thierry Zintz is the Dean of the Faculty of Sports Sciences of the Université catholique de Louvain. He is also Vice President of the Belgian Olympic and Interfederal Committee and member of the Board of Archery World – Europe. Thierry has earned his Ph.D. in Physical Education (Management of Sport Organizations) from the University catholique de Louvain (Belgium) in 2004, where he also graduated in Physical Education in 1977. Since 2005 he has been teaching Management of Sport at the Université catholique de Louvain. He is also an invited lecturer at the Université de Poitiers and at ESSEC (Paris) as well as a researcher in Sport Management (having published several articles and two books on the topic). Thierry is the director of the MEMOS Programme (Executive Master in Management of Sport Organisations). This programme is a co-organisation of the International Olympic Committee and twelve universities in the world. Major areas of interest and expertise: ‘Organisational Configurations of National Sport Federations’ and ‘Change Management in Sport Organisations’, with particular focus on the relation between professional and volunteer actors, management and recruitment. Vilma Cingiene is a professor of the Faculty of Politics and Management at the Mykolas Romeris University, Lithuania. She is a founder and co-ordinator of the Master degree study program „Sports Industry Management“. Having graduated from Lithuanian Physical Education Institute with Physical Education degree, she holds PhD in Social Sciences (economics) from Moscow State Lomonosov University. Vilma is an initiator and co-ordinator of different national and European projects and serves as Qualification system implementation and management expert in various working groups. Also she is a delegated member by National sports authorities to EC expert group “Sport Statistics” (2011-2014) and „Economic Dimention of Sport“ (2014-2017)“. 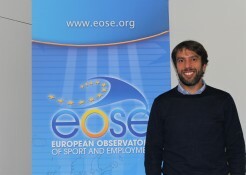 Major involvement with EOSE: Led Researcher for the ESSA-Sport Project, LMI leader for the S2A-Sport project, National Ambassador in VSport+ project, Feasibility Study on Mobility in Sport in Europe. Mairit Pellinen is currently working as the International coordinator for the Sport Institute of Finland and the HAAGA-HELIA University of Applied Sciences. She holds a Master of Sciences in Physical Education from the University of Jyväskylä, Specialist Qualification in Management and a vocational qualification for sport instructor. Graduated from the University of Jyväskylä in 1988, Mairit’s work experience includes working for the Sport Federation, several Finnish Municipalities and the Private sector. She has been involved in international networks and different EU-projects since 1997. Abel is currently working as Head of Sport Management Programme and Professor of Human Resources Management and Strategic Management of Sport Organisations at the Sport Sciences School of Rio Maior (ESDRM) in Portugal. He holds a PhD in Sport Sciences and Sports Management from the University of Lleida and has been previously working for the National Sport Council, the Sport Instiute of Portugal and as a Basketball coach in various clubs. Major areas of interest and expertise: Research on Human Resources in sport, Strategic Management of Sport organisations, Development of local sport policy.